Preventing Childhood Obesity in Early Care and Education is the new set of national standards describing evidence-based best practices in nutrition, physical activity, and screen time, for early care and education programs. The standards are for all types of early care and education settings - centres and family child care homes. These updated standards are a part of the new comprehensive Caring for Our Children: National Health and Safety Performance Standards: Guidelines for Early Care and Education Programs, Third Edition. Updated all MyPyramid references to MyPlate. The American Academy of Pediatrics (AAP) is an organization of 67,000 primary care pediatricians, pediatric medical subspecialists and pediatric surgical specialists dedicated to the health, safety and well-being of infants, children, adolescents and young adults. The AAP is the largest pediatric publisher in the world, with a diverse list of resources that includes essential clinical and practice management titles and award-winning books for parents. The American Public Health Association (APHA) champions the health of all people and all communities. They strengthen the public health profession and speak out for public health issues and policies backed by science. APHA is the only organization that influences federal policy, has a nearly 150-year perspective, and brings together members from all fields of public health. APHA publishes the American Journal of Public Health and The Nation's Health newspaper. At their Annual Meeting & Exposition, thousands of people share the latest public health research. APHA leads public awareness campaigns such as Get Ready and National Public Health Week. The National Resource Center for Health and Safety in Child Care and Early Education (NRC), an inter-professional team at the University of Colorado College of Nursing, promotes improved health and safety practices in child care and early education programs. 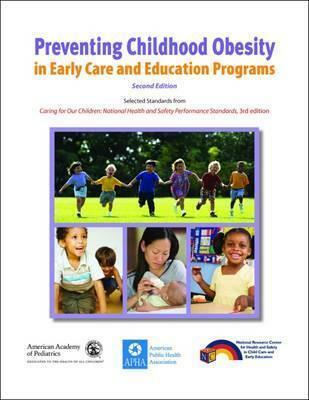 The NRC engages expert collaborators to infuse current policy and evidence into Caring for Our Children: National Health and Safety Standards; Guidelines for Early Care and Education Programs, 3rd edition (CFOC3), available in print and as a searchable database at www.nrckids.org.